With a revolutionary design that allows for incredible loop stability at distance, a unique taper that allows a rod to load at close range and a positive front taper that delivers perfect presentation of flies between sizes #22 and #2, the RIO Gold is the ultimate all round, floating line for freshwater fly fishing. With a revolutionary design that allows for incredible loop stability at distance, a unique taper that allows a rod to load at close range and a positive front taper that delivers perfect presentation of flies between sizes #22 and #2, the RIO Gold is the ultimate all round, floating line for freshwater fly fishing. The long back taper is excellent for mending and for roll and spey casting and the running line and head are different colors, making it easy to find the line&apos;s perfect loading point. The line features RIO&apos;s XS Technology for an extraordinarily slick, dirt-repelling coating, as well as Rio &apos;s AgentX and Super Flotation Technology that ensure the tip and the running line will float high. A welded loop on both ends of the fly line facilitates changing leaders and allows for fast rigging and line changes. We&apos;ve all wanted a higher floating line for a long time but, even as remarkable as our fly lines are, they can&apos;t float without a little technological intervention. Traditionally, getting a line to float has required mixing a bunch of tiny glass balls (called microspheres) into the soupy coating compound prior to the curing phase. The higher you want your line to float, the more glass balls you must add. But this creates a problem in that the microspheres can create a rougher, microscopically abrasive coating that has less plastisol which results in a structurally weaker fly line that cracks. So, after years of experimenting with exotic compounds and plenty of waist-deep R and D, our lab people discovered an element far more buoyant than the rest of the industry. But the right element was just the start. It took an exponential leap in rethinking the manufacturing process to put it all together. AgentX is a result of the combination of a highly buoyant undercoat coupled with a super-smooth outer coating, and it produces the smoothest, most durable, and highest floating fly lines imaginable. A customer survey performed by RIO showed that the number one complaint for fly lines was that the tip sank. RIO&apos;s chemists deduced that if one coating of AgentX was so buoyant, then two coats must be, well, really buoyant, and the end result is SFT - Super Floatation Technology. Simply put, this is a manufacturing technique that allows us to fuse two layers of buoyant AgentX coating together. This specialized process is applied to the front few feet of the fly line, producing a tip with a specific gravity of around 0.70. Compare that to the standard s. g. of 0.88 on regular fly lines and you get an idea of just how significant this is. Every fly fisherman is looking for a slicker line, and for good reason. Slicker line means longer casts, which is something all anglers strive to achieve. XS Technology is the latest development from RIO&apos;s lab coats that focuses on creating an ultra slick line, with dirt-repelling tendencies. XS (Extreme Slickness) Technology began when RIO&apos;s chemists began reformulating conventional chemical combinations. Although RIO&apos;s formulas were great, our scientists are fly fishers, and by definition they want an even slicker fly line - it&apos;s just part of the deal. So first, they tackled the polyvinyl chloride (PVC) coating and through intense scrutiny down to the polymeric mix level, (say that 10 times fast) they defined some fundamental limitations. Out went the old PVC/silicone formulas and by methodically adding a little more of this, a little less of that, and a pinch of secret sauce, the lab coats cooked up a completely new and improved recipe. 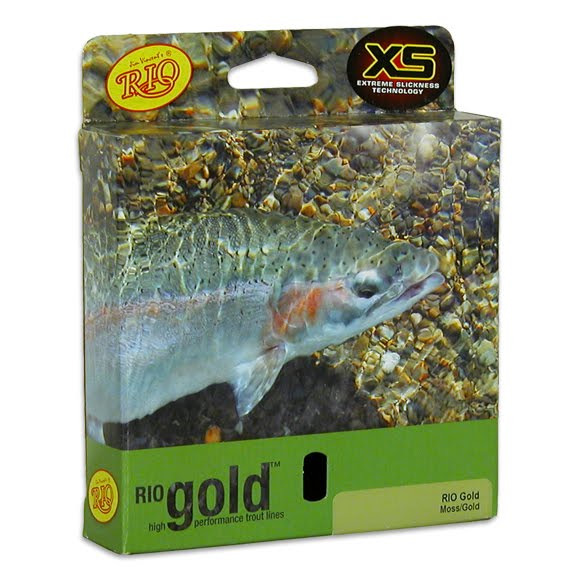 With XS Technology, RIO has developed a fly line that is slicker, more stable, and far less apt to attract dirt, and paired with AgentX Technology, it engineers a line that is less dense, casts further and more accurately, floats higher, lasts longer, and offers more consistent performance cast after cast, strike after strike, fish after fish. DualTone is a system perfected by RIO that marks the sweet spot of a fly line by providing an obvious color change in the line. The design of every fly line taper, its most likely application and each individual line size is carefully taken into account, and the location of the color change is unique to each fly line. Every line model and size is tested on a selection of fly rods to find the ideal place where the rod loads, and the color change starts at that point. With the DualTone system it is easy to see how much line to strip in, where to pick up a cast, how much line can be held in the air when false casting, and when to make the final cast.